Can I view the warehouse? Yes, by appointment, you can always view your goods. What products can be stored, packaged and shipped? Everything except: Dangerous goods, perishable goods, drugs and animals and plants. How much storage do I have at PackAngels? As much as you want. There is no limit to the top. Minimum amount of storage is always 1 pallet. Yes. As stated in our terms and conditions the goods are insured. What packaging materials does PackAngels use? We use the safest packing for each product. In addition, we use fillers and boxes and tape with the PackAngels logo on it (for a surcharge also your logo). How do I submit my orders to PackAngels? Every product that we house is identified by barcode. The product has a certain designated place in the warehouse. Simply send us an email or use the website form indicating what products are involved as well as the addresses of the recipients. That is all you have to do. How fast does it take from submission of the order to the shipping of the goods? How are the goods shipped? We choose the shipping method that matches your product and take your package safely and reliably to your customers. To this end, we work with all the leading service providers and take advantage of our conditions. Where can my packages be shipped? It is time that you stop packing your product yourself. It is time for you to fully concentrate on your online business. 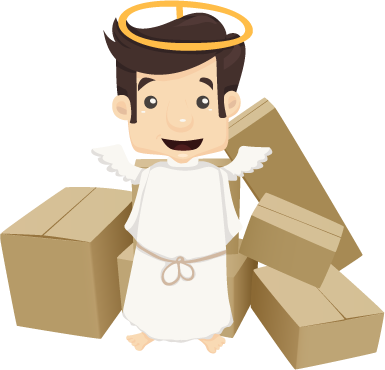 It is time we become your warehouse and shipping angels. It is also time for you to save money! With us you will never again have to deal with the headache of how best to store, package and ship your products. This means we will take care of the entire logistics handling to quickly, reliably and professionally ship your goods to your customers. You always have full visibility and control over stock levels and stock movements. In particular we take care of: receiving, storage, custom shipping processing, multi-channel handling, track & trace, reporting, customs clearance and returns management. How much will it cost to use PackAngels? You only pay if you really use our services: If we pack, ship or store for you. Any returns reach our central warehouse near Frankfurt am Main. We will notify you that a return is present. You can then decide what happens to it.